1. On December 7, 2016, a PIA ATR 42-500 (AP-BHO) flying from Chitral to Islamabad crashed near Havelian killing all 47 souls on-board. Safety Investigation Board (SIB) of Pakistan was mandated by the Federal Government to carry out detailed investigation into this unfortunate air crash. The investigation is towards a concluding stage, however, some important findings of technical nature require immediate attention/intervention. (a) Sequence of events was initiated with dislodging of one blade of power turbine Stage-1 (PT-1), inside engine number one (left-side engine) due to fatigue. (b) This dislodging of one blade resulted in in-flight engine shut down and it contributed towards erratic/abnormal behavior of engine number one propeller. (c) According to Service Bulletin these turbine blades were to be changed after completion of 10,000 hours on immediate next maintenance opportunity. The said engine was under maintenance on November 11, 2016, at that time those blades had completed 10004.1 hour (due for change). This activity should have been undertaken at that time but itwas missed out by the concerned. (d) Aircraft flew approximately ninety-three hours after the said maintenance activity, before it crashed on December 7, 2016. (e) Missing out of such an activity highlights a lapse on the part of PIA (maintenance and quality assurance) as well as a possible in-adequacy/lack of oversight by Pakistan CAA. 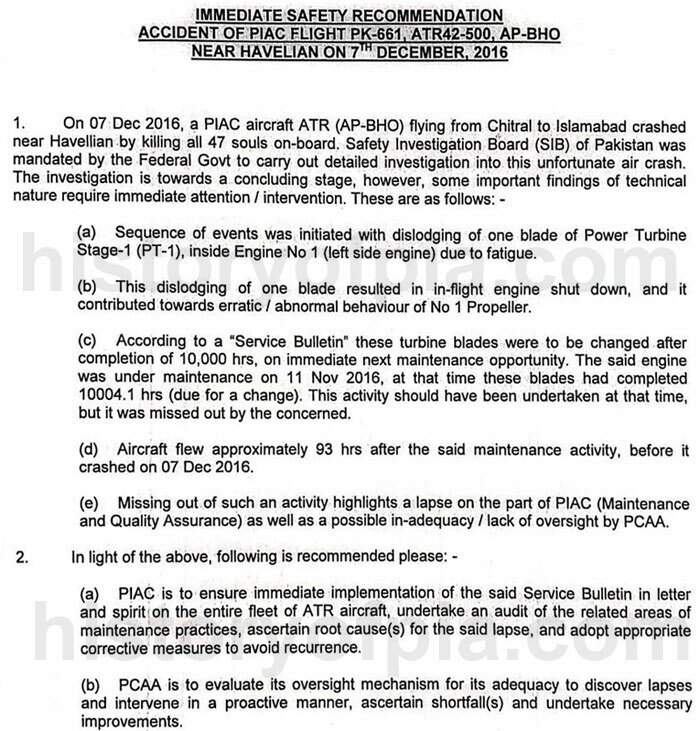 (a) PIA is to ensure immediate implementation of said Service Bulletin in letter and spirit on the entire fleet of ATR aircraft, undertake an audit of the related areas of maintenance practices, ascertain root cause(s) for the said lapse, and adopt appropriate corrective measures to avoid recurrence. (b) Pakistan CAA is to evaluate its oversight mechanism for its adequacy to discover lapses and intervene in a proactive manner, ascertain shortfall(s) and undertake necessary improvements. But why the aircraft crashed. What happened after No 1 engine failure/problems, Why the aircraft could not sustain flight on remaining good engine????? Another question: Was Engine No. 2 in good shape? Was it maintained as required by it? presumably dislodging of 1 blade caused wing structure damage and loss of hull? There's no evidence of this. From the ATC tape audio released online (it's on youtube), the pilots declare an emergency after losing an engine. On the last transmission from the crew, you can hear the stall horn/warning going off in the background. Most likely probably cause for the crash is going to be a loss of airspeed after an engine failure, increased angle of attack, and subsequent stall. Once you stall an engine-out multi-turboprop, a spin is almost guaranteed. Stall/spin into the ground type of accident. This "preliminary final" report is a joke. First, just because the engine failed does not mean the aircraft will crash. It should have been flyable on the remaining engine and safely conduct a single-engine approach and landing at ISB airport. Second, I understand that the propeller blade should have been changed at the 10,000 hr mark. No doubt that was missed by the PIA maintenance/authorities. However, the report clearly says that blade only went about 93 hrs above the 10,000 mark. When engineers design these components, they don't make it so that if you go above by 90 hrs from the recommended overhaul, the whole thing blows up and fails. There is extra safety room accounted for by the manufacturer. The blade still shouldn't have failed at 10,093 hrs. What they really ought to look at is how PIA maintained these engines and propeller blades. What intervals, what procedures, etc. I wish the French BEA (who read the black boxes for this crash) would just release their own report - I'd take their word over anything out of the CAA SIB any day of the week. Its high time we have an independent investigation body, not a department of CAA to perform crash investigations. Usually there is a percentage or allowance in hours deviation allowed by the manufacturer (normally its plus or minus 100 hours). so if the blade was supposed to be replaced at 10000, a 100 hour allowance means it could have safely flown till 10100. and lets say even if the blade has broken down, that doesn't mean the aircraft should crash. such limitations are given in the operator's approved aircraft maintenance program not ex ceeding the manufacturer's limitations. if that limit was crossed, then indeed its a negligence, but again an inflight shutdown wont lead to a crash. The engines are designed with bird strike impact which destroys the blades easily. In Pakistan, be it PAF or PIA, unfortunately there always exists a spat between pilot and ground staff community which hinders transparency in investigations. Each try its level best to shift the blame on the other. In other countries such disputes are discouraged at corporate level. besides, whats the source of this report ? haven't seen it on PCAA's website. Last edited by siddhi817 on Sun Jan 13, 2019 3:26 pm, edited 1 time in total. ^ Small correction: 10% would make it 11,000 hours, not 10,100. HRS. 2. Pilot mistake (Air France accident is not very old, pilots still are prone to reacting in a wrong way to further aggravate the situation in case of technical malfunction). The data recorder should reveal the inputs after failure. If it's a nose up maneuver existing, certainly a pilot error IMO. Acting CEO PIA Air Marshal Arshad Malik at a press conference said that Safety Investigation Board (SIB) Safety Recommendation has cautioned PIA. PK-661 crash final investigation report after its completion will be presented by CAA/SIB to the federal government. 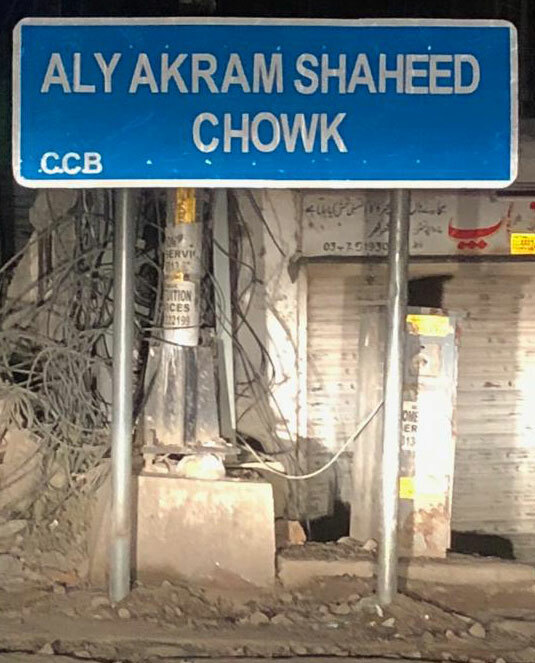 A chowk named by Chaklala Cantonment Board (CCB) in Pakistan after Aly Akram who as a First Officer was aboard PIA ATR 42-500 (AP-BHO) Chitral to Islamabad flight PK-661 that crashed near Havelian, Abbotabad, on December 7, 2016. According to Pakistan Civil Aviation Authority (CAA), recommendations made by Safety Investigation Board (SIB) are to be given final shape/version. Complicated aspects of the accident are being reviewed that will reveal/identify primary and secondary causes of the crash. The safety recommendation issued by SIB shown and discussed on media was released to prevent occurrence of such accident in future.